Mary Shelley’s novel Frankenstein was famously conceived during a “waking dream” one stormy evening in the Swiss Alps nearly two centuries ago. Now, her original inspiration has sparked the field of electroceuticals, a novel endeavour, which has just been backed by the National Institutes of Health and on which it plans to spend $248m throughout its lifetime. When Shelley wrote her gothic masterpiece on the shores of Lake Geneva, she brought ­Victor Frankenstein’s fictional monster to life by harnessing the power of electricity. By doing this, she acknowledged how, during the previous decades of the age of enlightenment, scientists had discovered the nervous system was electrical in nature, rather than animated by spirits. In 1780 an Italian doctor, Luigi Galvani, observed that the muscles of dead frogs’ legs twitched when struck by a spark (his original tools are on display at London’s Science Museum). In 1803, Galvani’s nephew Giovanni Aldini connected batteries to the corpse of an executed murderer to reanimate them. Although all of our cells use electricity, two rely on it in a rapid way: muscle and nerves. Galvanism lives on today in defibrillators to jump-start a stalled heart, or in pacemakers to regulate the rate at which the heart pumps blood. Nerves are stimulated with cochlear implants to restore hearing, deep-brain implants to treat Parkinson’s and retinal implants to restore sight, for example. While electricity in wires travels at the speed of light, (around 300,000 kilometres per second), signals are carried around our bodies at a leisurely 0.8km per second, or about 2,900 kph. The reason is that while the electricity we use at home relies on electrons – sub-atomic particles which carry electrical charge – the electricity in our bodies is carried by larger, more complex charged atoms, or ions, which are found in salts such as sodium chloride. There are “gap junctions”, tiny tunnels that allow neighbouring cells to exchange ions, and their membranes are also studded with tiny pores (constructed from proteins), which allow the free movement of ions. These pores are known as ion channels and in nerve cells opening these channels is a crucial step in generating action potentials – the signals by which cells communicate in the brain. One kind of electroceutical acts on these ion channels. Cystic fibrosis, epilepsy, heart arrhythmias or migraine result from ion ­channel dysfunction and are targets of drug ­electroceuticals. At Tufts University in Boston, Michael Levin has done basic research that suggests ion channel drugs could have wider uses in organ regeneration and many other treatments, since bioelectricity plays a role in embryo development, wound healing and even affects the signals that prevent tumour formation. “The use of electroceuticals to trigger nerve signalling is only the tip of the iceberg. The true potential of electroceuticals will be reached when the community takes advantage of these drugs to control bioelectric signalling in non-neural cells, for transformative applications in regenerative medicine, cancer, and synthetic bioengineering,” Levin says. Then there are attempts to go beyond pacemakers and other stimulating devices to control the action potentials in individual neurons. We have known for some time that nerves fine-tune a heartbeat, the rate of breathing or lower blood pressure. In the spleen, they can alter the activity of T-cells – immune cells – to halt the production of inflammatory substances, such as the tumour necrosis factor that accumulates in joints in rheumatoid arthritis. And there are nerves in the skin that can suppress infection. The newly-emerging field of electroceuticals aims to extend this understanding of the body’s electrical grid and the language of nerve impulses to treat autoimmune diseases, asthma, diabetes and gastric conditions. The simplest opportunities lie in the peripheral nervous system – outside of the spinal cord and the brain. One notable target is the vagus nerve, a nerve superhighway that snakes its way from the head through the abdomen to link the brain with major organs. Now the greatest challenge is extending the detail of current understanding to teasing apart the myriad signals that run to and from each organ. With this in mind, the US National Institutes of Health is launching an effort to map the body’s electrical wiring and develop implants. “The NIH plans to spend $248m throughout the lifetime of the programme,” says a spokesman. Elegant tools have been developed in recent years to boost researchers’ ability to analyse the signals and circuits running through the nervous system, notably optogenetics, where nerves are genetically altered to contain light-sensitive proteins, opsins, so they can be controlled with beams of light. Ed Boyden at MIT’s Media Lab in Cambridge, Massachusetts, recently unveiled one non-invasive optogenetic tool that makes it easier to screen for targets that, when stimulated, might cause a therapeutic effect. He has also found a way to independently control the activity of two populations of nerves simultaneously by extending the range of opsins. “This is really important if you want to develop an electroceutical that controls multiple kinds of information all at once,” he says. Kristoffer Famm, head of the bioelectronics unit at GSK in London, points out that many features of organ function are controlled by the nervous system so that, rather than using a pharmaceutical, impulses could offer the possibility of much more precise control. Rather than expose the entire body to a drug that circulates in the blood stream, an electroceutical implant could tweak activation of a single nerve, such as the one that controls the bladder, or the vagus nerve, which has numerous roles, including in inflammatory response and appetite. He envisages the use of rice grain sized implants that sit on nerves, record their behaviour and, when something goes awry, stimulate or dampen the nerve accordingly. Various companies are now bringing electroceuticals into the clinic. Earlier this year the US Food and Drug Administration approved a device to treat sleep apnoea, developed by Inspire Medical Systems of Minneapolis, to stimulate airway muscles to regulate breathing. ElectroCore in New Jersey is studying fibres within the vagus nerve to dampen activity of neurons that control airways, prompting them to open and so avert an asthma attack. And EnteroMedics in Minnesota has a pacemaker-like device that stimulates the vagus nerve to make a person feel full. 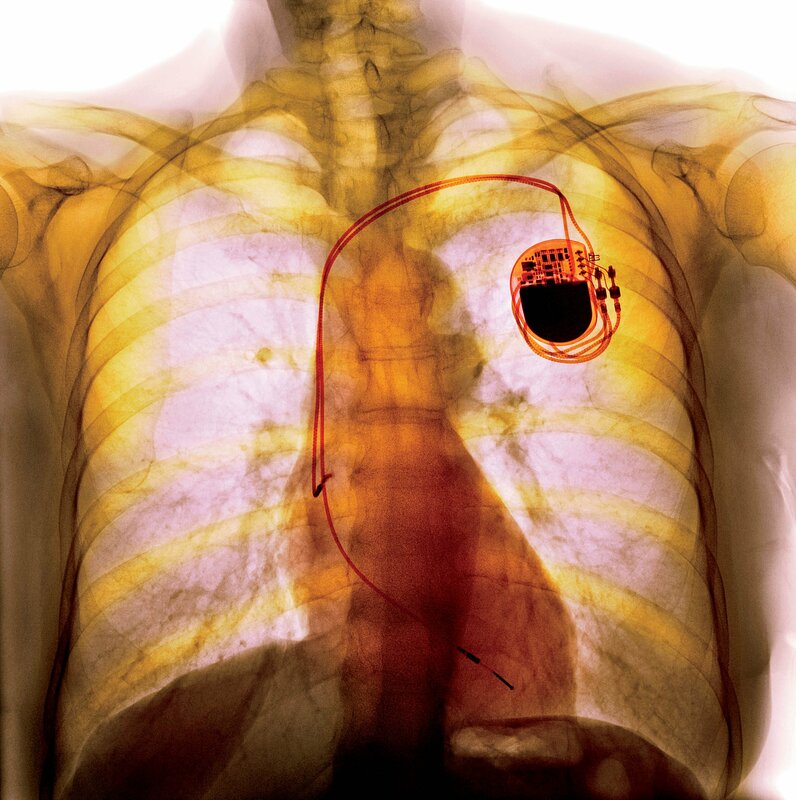 Within a decade or two, electrical implants could treat a wide range of common conditions.